In our last couple of posts, we looked at medium machine guns. In today's post, we will look at some developments in the General Purpose Machine Gun (GPMG) category (otherwise called Universal Machine Gun or UMG). A general purpose machine gun is a weapon designed to use both magazines and belt feed, firing full sized rifle-cartridges, which is air-cooled and designed to be used either as an infantry support weapon (i.e. like a light machine gun), or as a vehicle mounted weapon (i.e. like a medium machine gun). Since it is air-cooled, a GPMG usually features quick-change barrels, so it can continue to fire on automatic mode for longer periods of time. A general purpose machine gun can be mounted on a bipod or a tripod, or even from a vehicle, such as a jeep or a helicopter. The first GPMGs were something we'd just studied in the previous post. The MG 34 was the first general purpose machine gun. Carried by an infantry man with a drum magazine and mounted on a bipod, it served as a great infantry support weapon used for offensive operations. By switching the magazine with an ammunition belt and mounting it on a tripod, it became a very good medium machine gun. Mounted on a tank or a vehicle, it was an effective anti-aircraft and defensive machine gun. The only problem with the MG 34 was that it was somewhat harder to manufacture, due to the fact that it needed some precision machining. Due to this, the Germans came out with the MG-42, which was easier to manufacture, more reliable, and as an extra bonus, had a higher rate of fire as well! 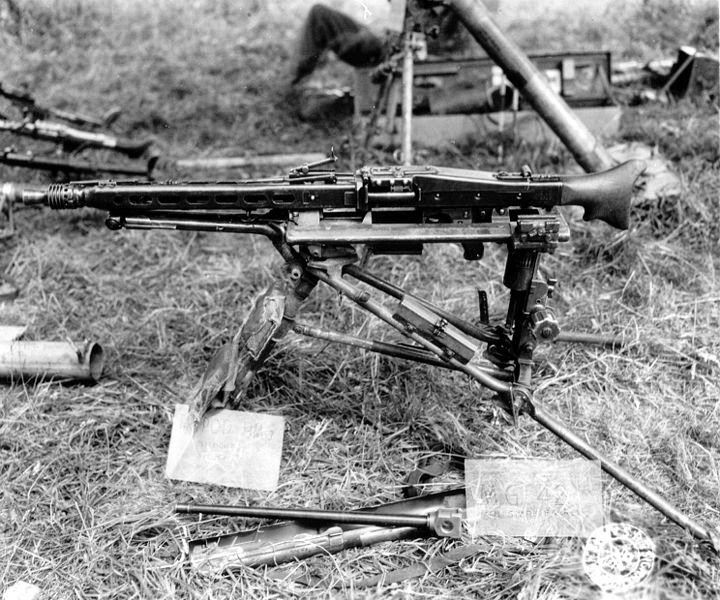 A MG-42 mouinted on a tripod. Click on the image to enlarge. Public domain image. The MG-42 design was extremely successful and some variants (such as the MG3 and MG74 models) are still in service in some militaries around the world. It also influenced other countries to manufacture their own GPMGs based somewhat on the MG-42 design. The US military was one of the first to pick up the idea of a GPMG from the Germans and started working on a design in the late 1940s. One of the requirements was that this gun had to be chambered to fire 7.62x51 mm. NATO ammunition and another requirement was that it should be capable of being fired accurately from the shoulder as well. After a number of trials, the final design was approved in 1957 and was called the M60 machine gun. The M60 served in various branches of the US military during the Vietnam war. It was carried by infantry units as a Squad Automatic Weapon (SAW) to support infantry operations and was also mounted on river patrol boats (PBRs), M113 Armored Personnel Carriers (APC) and as a door gun on helicopters. US Marines with a M60 in Vietnam. Public domain image. While the M60 saw service in Vietnam, some design flaws became obvious. For one, it had some jamming issues in muddy and humid conditions. It did better when used in static-defense or helicopter mounted roles, because it could be stored in cleaner conditions and regularly maintained. One more problem was the design of the barrel, which had a permanently attached bipod and this made barrel changes more difficult and took longer to accomplish. While some improvements to the design were made, the US military rejected the M60E3 and went with the Belgian FN MAG (which we will study in a second) and designated it as the M240 in US service. Around the time that the US was developing the M60, the Fabrique Nationale company (FN) of Belgium was also developing their own GPMG, which they called the FN MAG (the letters MAG stood for Mitralleuse d'Appui Generale, which is French for "General Purpose Machine Gun"). Like the M60, the FN MAG is also designed to fire 7.62x51 mm. NATO cartridges. While it is heavier than the M60 and uses a more complicated gas operated system, it is more reliable compared to the M60. This is why it was also adopted by the US military as the M240 to replace the M60s in service. The M240 was first mounted on to tanks in 1977 and later adopted by other US military branches during the 1980s and 1990s. US Marines firing a M240G mounted on a tripod. Click on the image to enlarge. Public domain image. 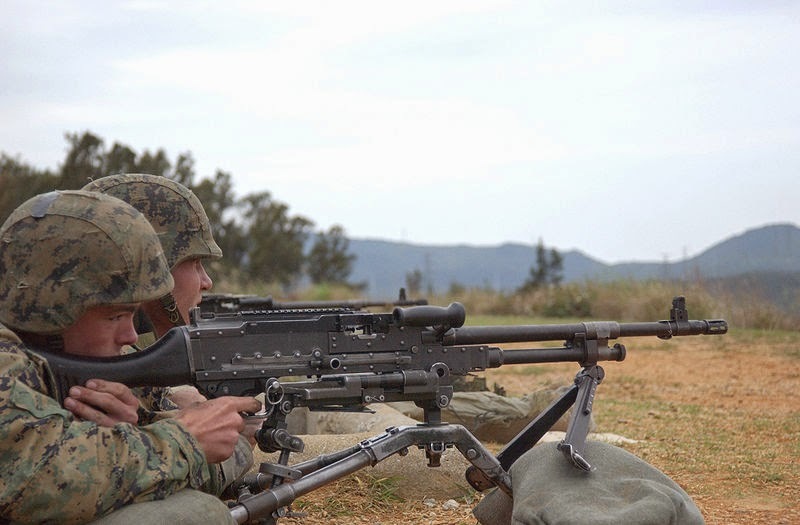 The FN MAG and the M240 continue to be used in service in many military forces around the world. Other GPMGs include the Soviet PK series, the Heckler & Koch HK 21 etc.